Visual, 16” x 16”, approx. Description: Decorative Home Fashion Pillows of an Original Carol Tate Hand Stencil Printed Design of Alternating Border Prints. Eco Friendly Remnant of Silk Taffeta Fabric was Pre Washed and Shrunken to Achieve a Slight Crinkle Effect, Then Hand Stenciled in a Tarnished Old Gold Metallic. Self Welt, Feather Down Inserts, High End Hand Stitched Closure. A Pair of Eco Friendly Artisanaware Accent Pillows Evoking an Olde World Flavor, And Inspired by Euro Textile Surface Design. 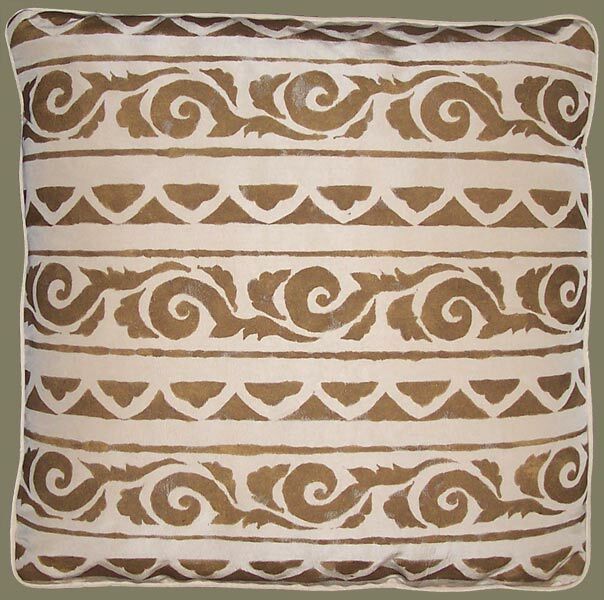 These Comfortably Elegant Designer Throw Pillows are in a Base Color of Almond, Off-White. Though a One of a Kind Pair See Coordinating Border Print and Floral Pillows.